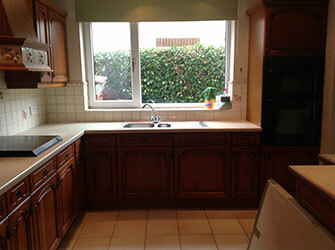 Removed all existing kitchen doors and drawers for off site preparation and spraying. All onsite preparation and spraying. Rebuilt freestanding unit and resprayed in a fern satin finish. 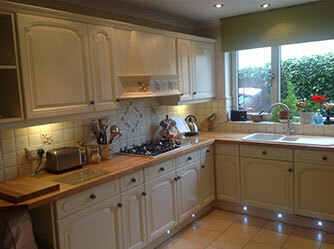 Installed new prime oak worktops and finish in a laquer satin finish. New pewter door knobs fitted.